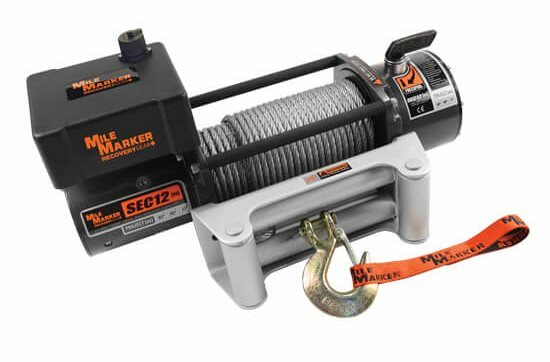 Mile Marker 76-50251BW SEC12(es) Truck/SUV Winch: Enjoy 12 000 lbs Power! If you are a fan of the top class products, then it is your chance to surprise your friends showing the greatest winch ever. Do you wonder what it is? You can easily guess that it is the winch of one of the most popular producers -Mile Marker. It has manufactured a very powerful winch able to help in any trouble. It is Mile Marker 76-50251BW SEC12(es) Truck/SUV Element Sealed Electric Winch with the 12,000 lb. capacity. Want to check which great features the winch has, besides its enormous pulling power? You are welcome to learn everything you are interested in this detailed winch review. It is not surprising that professionals choose this winch model to explore new terrains. The winch can withstand any conditions and pull you out from anywhere thanks to the high-quality construction and its smart design where everything works the right way. What makes this winch your perfect choice? If you check its features and specifications, you will have no doubts that it is really worth considering as an option for your vehicle. The winch has a 3-stage planetary gear with the ratio 296:1. There are a wound motor and the 500-amp solenoid that is able to guarantee the full protection and maximum duty cycle. The hardware is made of steel. The winch looks stylish being versatile and convenient in use at the same time. The weight of the winch is 96 pounds. Specs: 76-50251BW Electric Winch Specs. What Features Make Mile Marker 12000 the Most Wanted Winch? Mile Marker 76-50251 BW can rightly be called the premium winch that is able to be a reliable helper in any conditions. You will be glad to know that the winch has a full sealed element. This means that it is 100% waterproof and snowproof. You shouldn’t be afraid of mud or water! The element is sealed according to the IP68 Standard. No doubts that it can deal with everything successfully. One of the distinctive features of this model is the absence of chrome construction. Another thing you will be happy to discover is the Dacromet roller fairlead. This is the famous coating, which differs with its top-notch quality properties to be resistant to corrosion. This winch model includes aircraft cable, a submersible solenoid, each of which contributes to the smooth operation of the winch. The winch has a wonderful look being designed with the use of modern technologies. This model is able to provide its owner with a safe and fast operation without errors. Should You Get Mile Marker 12000 lbs? The winch is durable both outside and inside. All parts of the device are made of the top quality materials. If you are a beginner or an off-road professional, you will find the winch the best option to choose in any case! Get it and check how smoothly it works! Need more capacity? Check our review on Mile Marker 76-50260W SEC15 15000 lb. Thank you for sharing an interesting review about this model as I was choosing among two models of this brand and had no idea which to choose. Now I can see that this one has more advantages compared to another one I have found.